With advanced age, many biological changes take place that work against conceiving and carrying the pregnancy to term. 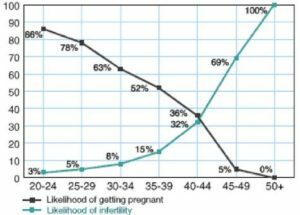 From age 30 to 35, there is a gradual decline in the ability of women to become pregnant; after age 40, there is a sharp decline. Also, the chance of miscarriage and chromosomal abnormalities, such as those that cause Down’s syndrome, increase with age. The success of in vitro fertilization (IVF) and other similar procedures decreases with advanced age. Why does age play such an important role in fertility? One reason is that as women age, they are less likely to ovulate regularly. However, the more important reason relates to the condition and decreasing number of the woman’s eggs. As the eggs age, they become more resistant to fertilization. Also, more of the eggs tend to have chromosomal abnormalities – oftentimes, this may result in miscarriage.